*Contains 7 bonus tracks. 20 tracks total. 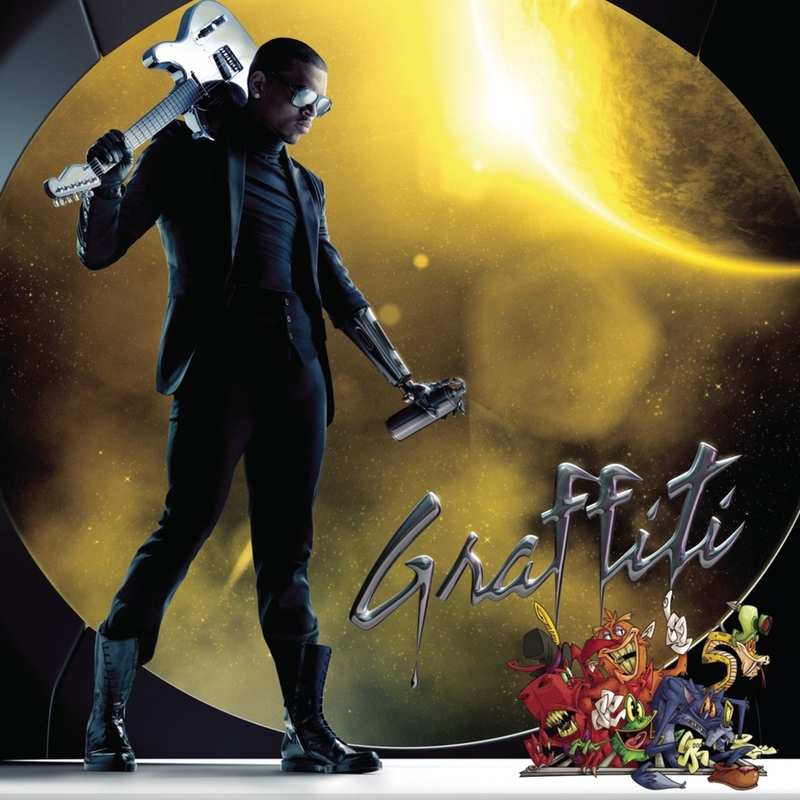 Most of Graffiti -- that is, the songs that do not detail what ex-girlfriend Rihanna and the rest of the world have done to him -- is a natural progression for Chris Brown. Like many young cred-seeking male singers who have just exited their teenage years, Brown clumsily emphasizes womanizing and hedonism and balances it out with a couple clean and empty ballads. Out of this portion of the album, only a couple songs leave a lasting impression, and when they do, the silly things that come out of Brown’s mouth tend to be the reason; take “As stingy as you are, I think you ready,” part of “Take My Time”’s chorus and hopefully no woman’s idea of an effective bedroom line. A two-track patch of gloopy and gawky Euro-pop, where he’s on slightly better behavior, is at least more tolerable than the inane chest-puffing, but nothing comes close to the big singles from Brown’s first two releases. The rest of this album could not have been voiced by anyone but a brat who pleaded guilty to the felonious assault of his pop star girlfriend, one who considers himself a victim. On “Famous Girl,” sonically sprightly but otherwise acidic and full of contradictions, Brown cries foul at being cheated upon by his “heartless” ex but taunts “I might have cheated in the beginning.” He accuses her of being a heartbreaker and then boasts “I’ve broken my share of hearts.” Another jab, “I was wrong for writing ‘Disturbia,'” makes it plain that the song is about Rihanna. Both “Falling Down” and the sarcastically titled “Lucky Me” could lead a onetime sympathizer to fantasize about pulling a Chris Brown on Chris Brown. In these songs, Brown is exceptionally insufferable, conveying that his unimaginable wealth and social privileges are no consolation for being put through the ringer. “Even though I’m so damaged, I gotta pick myself up and perform for the crowd” is capped with “You don’t even know how hard it is, do you?” He also lets his listeners know that he has had to do photo shoots when he has not felt like smiling, and that he has “given up everything in exchange for being alone.” Maybe his supporters should be considerate and assist in putting the young man out of his misery. If they stop purchasing his recordings, concert tickets, and merchandise, the evil entertainment industry, all media outlets, and predatorial heartbreakers will lose interest and loosen their grip on him.